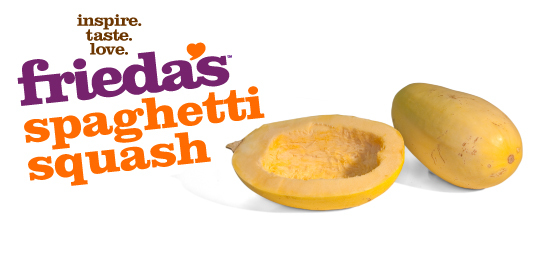 What is a Spaghetti Squash? This football-shaped squash gets its name because, after cooking, the flesh forms spaghetti-like strands when separated with a fork. It makes a perfect, low-calorie pasta substitute. Halve lengthwise and remove seeds. Place cut side down in a large pan with 2 inches of water. Cover and boil for 20 minutes. Check to make sure water does not evaporate. Squash is done when tender. Or, place cut side up in a dish with 1/2 inch water, cover loosely with plastic wrap and microwave for 7-8 minutes. Use forks to scrape flesh lengthwise to separate into strands. Top with tomato sauces, cheese, or a little butter and brown sugar.